The Thunder defeated the Kunlun Red Star, who are playing in their inaugural season in the CWHL, 2-1 after Stacey tied the puck up and over the left shoulder of CWHL goalie of the year Noora Raty’s shoulder to clinch the victory. It was just past the eight minute mark of the opening frame when the Thunder struck first. A hard point shot from Nicole Kosta, allowed returning Olympian Laura Fortino to corral the puck behind the net and find Nicole Brown out front for a quick release shot that beat Raty. The Thunder continued to apply pressure to Red Star in the second period, putting the Raty to work as they outshot them 24-12 through 40 minutes of play. Power play opportunities for Red Star also provided them with chances to knot the game. Kelli Stack, the CWHL regular season scoring champion, parked herself in front of Thunder netminder Erica Howe and deflected a Zoe Hickel shot past the goalie to tie the game 1-1. A wide-open third period saw Megan Bozek, a Thunder mid-season free agent signing, pepper Raty with booming shots from the point. On the other end it was Red Star’s Alex Carpenter providing an offensive spark. However, both teams defensive units were able to clear away pucks, block shots and become pivotal in the final minutes of play sending the teams to overtime. Stacey’s tip-in during overtime sent the Ricoh Coliseum into a frenzy, earning her the first star of the game. Thunder goaltender Erica Howe was named the Clarkson Cup MVP. Thunder forward Karolina Urban announced her retirement from the CWHL in a post on social media following the game. “What a way to end my hockey career. I am so proud of each of my teammates who continue to pave the way for women’s hockey by being role models and elite athletes every day,” she said. The Thunder franchise, made the move to Markham this past offseason. Previously, as the Brampton Thunder they made two appearances in the championship finals in 2012 and 2010. 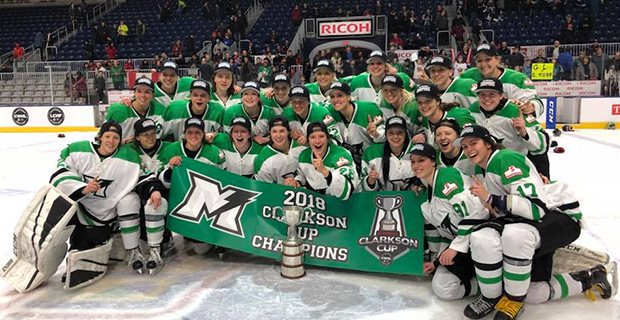 As voted on by the CWHL players, Markham Thunder forward Jamie Lee Rattray was named the winner of the Jayna Hefford Trophy, during the CWHL’s annual awards show. Kelli Stack, Kunlun Red Star, claimed the Angela James Bowl, as the league scoring champion, with 49 points (26 goals, 23 assists). Teammate and Red Star goaltender Noora Raty was named the Goaltender of the Year. Raty lead the CWHL this season in both goals-against average (1.60) and save percentage (.944). Rookie of the Year honours went to the Calgary Inferno’s Sophie Shirley, who finished in the Top-20 in league scoring (eight goals, 11 assists). The Inferno’s Tomas Pacina also took home the Coach of the Year award. In his first season behind the Inferno bench, Pacina guided a roster that lost 11 Olympians due to centralization to only one loss through the first 13 games of the season. The Inferno finished in third place at the end of the regular season. Les Canadiennes de Montreal won the Chairman’s Trophy, awarded to the regular season champions and their player Cathy Chartrand won the Defenceman of the Year honours. This is her second time winning the award. Chartrand led all defencemen in plus-minus (+28) and finished in third among defencemen in scoring (five goals, 17 assists). The Humanitarian Award went to Brad Morris, who previously served as CWHL chairman and has played a major role in milestones for the CWHL including the expansion to China and supporting the Thunder franchise in their move to Markham.